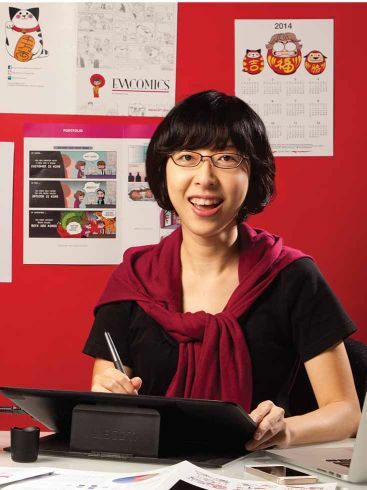 Evangeline Neo is the author and artist of Eva, Kopi and Matcha. She is a lucky Singaporean, who has attained scholarships to pursue her Bachelor of Fine Arts (BFA) degree in San Francisco in 2004 and her Masters in Business Administration (MBA) in Tokyo in 2010. Apart from having studied overseas, she has worked for five years as a full-time staff in a local education institute, working on 3D game prototypes and teaching life drawing. She has been drawing webcomics actively for seven years and is now working full-time as a comic artist in her own company. She is fluent in English, Chinese, and Japanese. Eva dislikes people calling her “Auntie” and has managed to look young (though not beautiful) with the use of Japanese skincare, filtered water, and lots of sleep with big dreams.